Many social infrastructures and buildings are aging. Therefore, inspections to find deteriorated parts to prevent accidents are important. 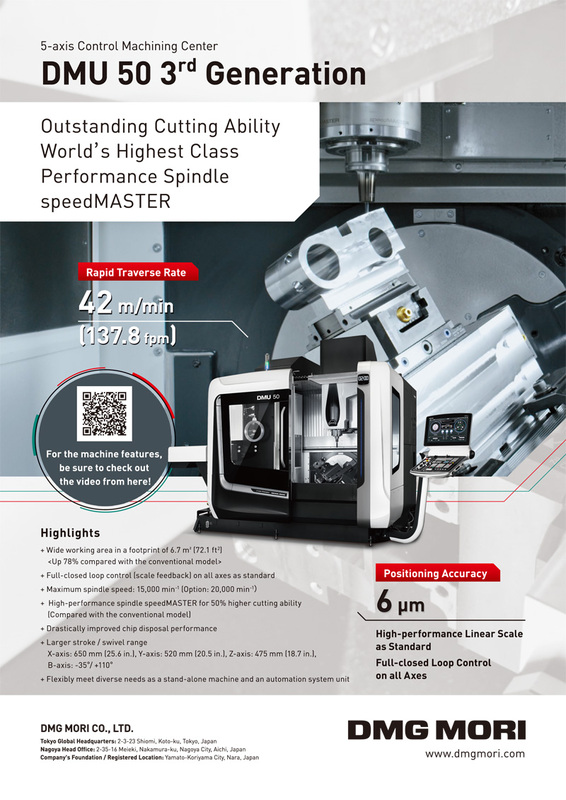 However, significant costs and inspection time are required for the current technologies. Therefore, inspection methods using robots are attracting attention. 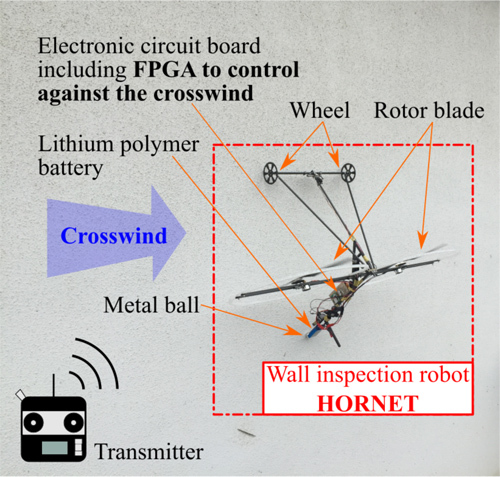 As the most appropriate option to traverse freely on concrete bridges and building walls is by traversing with lift force from propellers, a robot called HORNET has been developed that can run along a wall with two rotors. However, the floating-type robot with propellers could drop from a wall if hit by strong wind. Therefore, a gyro sensor was installed in the robot to detect its posture and adopted a simple maneuvering assist control to reduce the above-mentioned issue. In this study, the motion of HORNET was analyzed and a simple control system was designed to realize the maneuvering assist control. It was confirmed that the resistance of HORNET to the crosswind was improved by adding the control system. Y. Takada, Y. Tokura, Y. Matsumura, T. Tanaka, and T. Kanada, “Wall Inspection Robot with Maneuvering Assist Control System Against Crosswind,” J. Robot. Mechatron., Vol.30, No.3, pp. 416-425, 2018. W. Lee and S. Hirose, “Contacting surface-transfer control for reconfigurable wall-climbing robot Gunryu III,” J. of Robotics and Mechatronics, Vol.25, pp. 439-448, 2013. Y. Takada, S. Ito, and N. Imajo, “Development of a bridge inspection robot capable of traveling on splicing parts,” Invensions, Vol.2, No.22, 2017. Y. Takada, K. Kirimoto, T. Tajiri, and T. Kawai, “Development of a bridge inspection robot working in three-dimensional environment (evaluation of driving performance of a moving mechanism with permanent magnets),” Trans. of the Japan Society of Mechanical Engineers, Series C, Vol.79, pp. 3135-3146, 2013. H. Kim et al., “Development of a wall-climbing robot using a tracked wheel mechanism,” J. of Mechanical Science and Technology, Vol.22, pp. 1490-1498, 2008. M. Ono, T. Hamano, and S. Kato, “Modeling and fabrication of a mobile inspection microrobot driven by a pneumatic bellows actuator for long pipes,” J. of Robotics and Mechatronics, Vol.18, pp. 11-17, 2006. A. Ariga, T. Yamaguchi, and S. Hashimoto, “Passively adaptable wall climbing robot in narrow space,” J. of Robotics and Mechatronics, Vol.23, pp. 1055-1065, 2011. N. Gravish, M. Wilkinson, and K. Autumn, “Frictional adhesion: a new angle on gecko attachment,” Integrative and Comparative Biology, Vol.42, pp. 1081-1090, 2006. M. P. Murphy and M. Sitti, “Waalbot: An agile small-scale wall-climbing robot utilizing dry elastomer adhesives,” IEEE/ASME Trans. on mechatronics, Vol.12, pp. 330-338, 2007. M. Ota, J. Wang, Y. Sato, and K. Nonami, “Optimal autonomous control of small-scale electrical driven helicopter with mimo model,” Proc. of the 2011 JSME Conf. on Robotics and Mechatronics, 2011. D. Iwakura and K. Nonami, “Indoor localization of flying robot by means of infrared sensors,” J. of Robotics and Mechatronics, Vol.25, pp. 201-210, 2013. M. Ichikawa, H. Yamada, and J. Takeuchi, “Flying robot with biologically inspired vision,” J. of Robotics and Mechatronics, Vol.13, pp. 621-624, 2001. Y. Tokura and Y. Takada, “Development of inspection robot hornet for wall of structures,” Proc. of the 2015 JSME Conf. on Robotics and Mechatronics, 2015. Y. Tokura , K. Toba, and Y. Takada, “Practical applications of hornet to inspect walls of structures,” J. of Robotics and Mechatronics, Vol.28, pp. 320-326, 2016.